Gibeon Meteorite was discovered by the Nama people. This meteorite fell in prehistoric times in Namibia, Africa. The meteorite created a debris field 171 miles long by 62 miles wide. Declare your bold sense of style with this unisex meteorite ring. 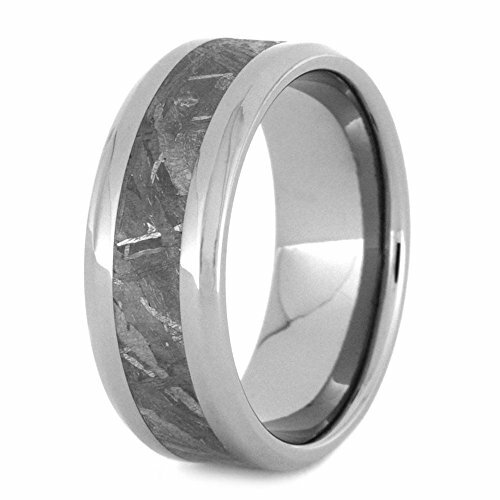 A beveled titanium band showcases a sleek Gibeon meteorite inlays that has been further enhanced to reveal the unique characteristics in the natural meteorite. Comfort Fit bands are designed with a rounded interior, allowing them to glide on and off over knuckles easier and do not pinch. As the name suggests they sit on the finger more comfortably than other rings. The band may feel slightly larger as Comfort Fit rings inside-centers are thicker. Titanium offers a unique combination of beauty and strength. You'll be amazed at the smoothness, comfort and feather-light weight of titanium. The 6AL4 Grade 5 Titanium is significantly stronger than commercially pure titanium. This is the same used in Biomedical Implants; it is hypoallergenic. It will, like other metals, scratch and the patina will turn to a satin finish. Choosing the right size for your custom ring is as important as the style. Titanium cannot be re-sized. It is highly recommended to have your size in a Comfort Fit measured by reputable jewelers until at least two agree on the same size to ensure your ring is the proper fit. Have it sized in the same width as the ring you are having made for you. Or purchase the sizing-ring with your ring to verify you know your correct size. If you are not sure of your ring size, have a custom-made sizing ring sent to you verifying the ring you ordered will truly fit. It will be sent to you first. Once you verify the ring size, your ring will be hand-crafted. Nature is Always Fashionable... Never Trendy. Thank You for Your Consideration. We Appreciate You.